Gyakuten Kenji 2 (逆転検事2, Gyakuten Kenji 2? lit. 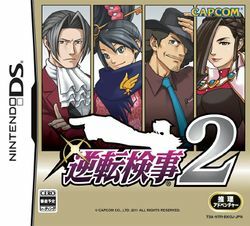 "Turnabout Prosecutor 2"), unofficially referred to as Ace Attorney Investigations: Miles Edgeworth 2, is an adventure video game for the Nintendo DS handheld game console by Capcom. It is the sixth game in the Ace Attorney series, and a direct sequel to Ace Attorney Investigations: Miles Edgeworth. There are currently no plans for Capcom to release the game outside Japan. The player again controls the renowned prosecutor Miles Edgeworth, as he takes on five new cases that see him reuniting with familiar faces from previous entries in the Ace Attorney series, and interrogating a new collection of witnesses and suspects. The player follows Edgeworth as he investigates crime scenes, gathers evidence, and pieces together logic, in order to find the truth behind each incident. An old acquaintance of Edgeworth's father also appears, and forces Edgeworth to consider which path he truly wants to follow - that of the prosecutor, or his father's footsteps and his childhood dream of becoming a defence attorney. This page was last edited on 12 March 2015, at 22:36.